The charm of Tuscany, in a house i Ghiacci, of six apartments, with swimming pool, in large property of over 300 hectares. 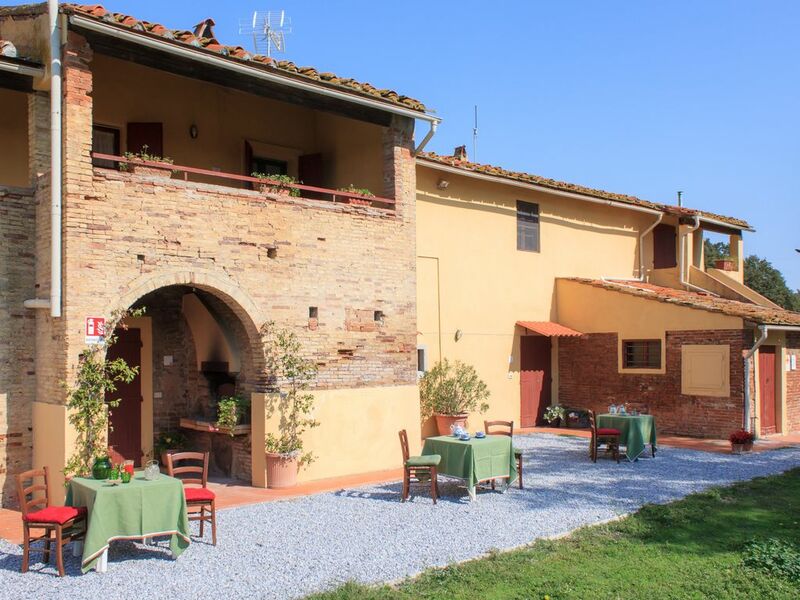 The Casa i Ghiacci hill is surrounded by woods, with miles of trails and a large riding school. Tenuta Vallelunga is an environment of exceptional beauty just a few kilometers from the main roads, it is a big green lung where you can go jogging in the morning (more than 10 km of trails in the woods and in the valley) and where children can be left free gallop on horseback in the middle of the farm while the parents relax in the pool of the Ghiacci house. Or you can decide to start discovering one of the cities of art that have made Tuscany famous in the world in just ten minutes you reach the highway. Relaxation, nature and culture all together. Il Camino is a spacious apartment on the first floor (90 sqm). Wooden ceilings, a spacious living room with a single sofa bed and a dining area, a fully equipped kitchenette with four burners, an oven, a fridge and a dishwasher. Two double bedrooms, a bathroom with shower, sink, bidet. Large garden with barbecue and tables, swimming pool and sun loungers. free, table tennis, free outdoor parking, laundry with iron / ironing board and washing machine. The house is located 15 km from the international airport and Pisa station, 10 km from the railway station and 8 km from the port of Livorno. The Marina di Pisa beach is 22 km away, Quercianella is 24 km away. Pets allowed on request. Towels and bed linen included in the price (sheets for cot not available). Cot and high chair included in the price but subject to availability. Exterior: Large garden with fenced pool of 6 x 12 meters (1.40 m and 2.50 m deep). Laundry. Barbecue. Games for children. Table tennis. we went to Vallelunga often. this is a very charming place, surrounded by woods and close to the sea. A beautiful and well maintained property, away from noise. We have always been very well received. this is an ideal place to visit Tuscany. Thank you Jean Pierre, we appreciated your company and are always happy to receive you. - wine tasting in the neighborhood and private visit to the Brunelleschi fortress in the medieval town of Vicopisano. - Riding school for children and adults in the property. - 12 km by bike and jog tracks in the property. Livorno, (8 km) and Livorno Harbor. Ferry to the Capraia, Gorgona and Elba islands. South: Populonia (Etruscan site), Bolgheri, Castagneto Carducci, Punta Ala, Castiglione della Pescaia.